The following three books arrived at my door and my children took off with them before I even had a chance to see the titles! After allowing them time to look through them, trade amongst themselves and excitedly announce the contents, I finally had my chance to enjoy the books. I was truly impressed with these books. There is something in them for everyone, and the excellent graphics and photographs just add to the appeal. 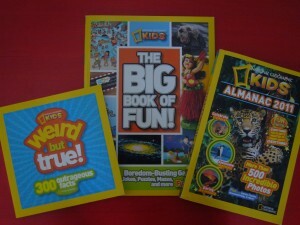 This fun little book contains 300 tidbits of information about everything from animals to outer space. With fun fonts, bright pictures and amazing facts, this book was a hit with everyone in the house. We learned how catnip affects lions, how fast a sneeze travels and how many calories you burn chewing gum. We discovered amazing animal facts, crazy world records and geographical tidbits. Weird but True is a treasure trove of information and an excellent conversation starter. My 7 year old son, Kellen, has claimed this book as his own. That comes as no surprise to me since it fits right in with his growing collection of encyclopedias and “how to” books. He loves to learn new things. When I asked him what he thought of the book, he said “Awesome!” and proceeded to educate me on the tallest tower in the world, and how the human brain works. He isn’t the only one who learned a few things from this book. It is full of fun and interesting information that taught me a few things too. It covers science, history, nature, technology, the environment, animals, geography and more. This is a must have for kids who love to learn. This activity book is filled with puzzles, games, riddles, etc. to occupy children’s minds. My 6 and 7 year olds showed mild interest in the book and attempted a couple of the games, but quickly moved on to the other two National Geographic books. I found the book interesting and occupied myself on several of the puzzles and games. I believe that this book would be very well received by children a little older than mine and it could be particularly useful for long car rides or similar situations where children need something to engage them. I would recommend this book for children over 10. Sheri is married to Mike, and the proud mother to four beautiful children. She enjoys spending time with her family, reading, sculpting and amateur photography, and she can often be found working in the garden or relaxing in the backyard.